When ants invade our properties, they have a huge impact on our homes and businesses. Their small size and foraging behaviour results in ants being able to rapidly access all areas of our homes and businesses. They will contaminate food preparation and food storage areas, with the risk of ants getting into the food we prepare. This is unacceptable in both food businesses and domestic kitchens, and so steps must be taken to quickly control this invasive insect. 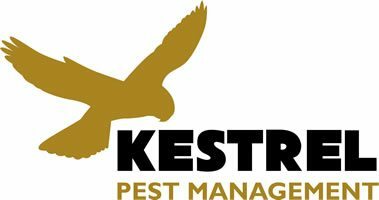 There are several species of pest ants that we at Kestrel Pest Management are asked to eradicate. However, the most common ant that we are asked to deal with is the black garden ant. 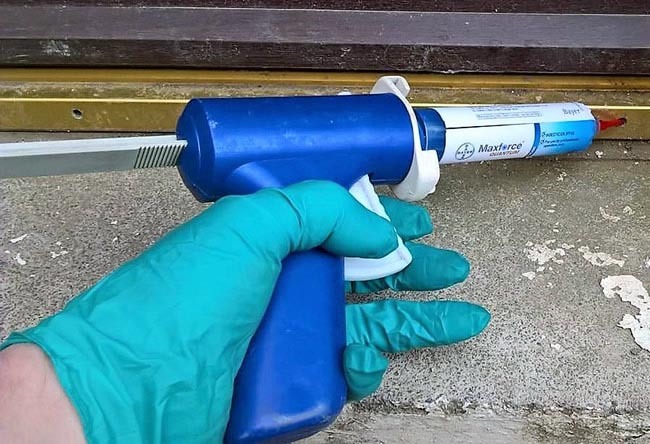 We have many years’ experience dealing with ants and utilise the latest products and techniques to ensure the successful eradication of any ant infestation. If you are unsure as to whether you have an ant infestation, then arrange an ant inspection with us. Our qualified ant expert will conduct a thorough property survey and if ant activity is confirmed, a control plan will be implemented. We also provide hygiene and housekeeping recommendations that will help to make the environment inhospitable to ant infestations. We will devise an ant treatment plan that will involve the use of insecticides that will safely and effectively eradicate the ant infestation. We will offer free advice on how to prevent future ant infestations. Ant Contamination: Ants are attracted into our homes and businesses as they forage for food. This foraging behaviour allows the ant to discover any available food sources such as food cupboards, pantries, food spillages, rubbish bins, pet food and food bowls, in fact anywhere there are scraps of food. Black ants are particularly attracted to sweet foods and confectionary, jams and sugary drinks are especially appealing to them. We have even known ants to contaminate medicines and pill boxes. When ants nest inside a property, this will present an added problem when the ants swarm (See Ant Life Cycle Below). This swarming behaviour happens when winged ants are produced within the nest and then take to the wing en masse. This can result in thousands of ants flying and crawling within the home or business, which can be quite alarming for the occupants. Ants Cause Loss of Reputation: As ants are so small, it is relatively easy for foraging ants to contaminate both the finished product and the raw ingredients during food preparation processes. Ants crawling over food or ants being cooked into a food product will not go down well with the customer. Therefore, an ant infestation in a food business can lead to damaging publicity, and social media feeds about pest issues in businesses intensifies the speed at which these stories are made public knowledge. Ant Damage: Ants like to nest in sandy materials and the sandy substrate found under paths and patios offer ideal sites for ants to make their nests. The extensive tunnel system that the ants excavate can cause paving slabs and blocks to subside. These excavations can also cause the roots of plants to dry out resulting in stunted growth or plants dying. Ant activity also displaces sand between block pavements/drives and allows weeds to grow. When ants nest inside a property they can sometimes damage plaster when they are nesting. We have found this on several occasions behind skirting boards, where the ants have broken down the plaster to a sandy dust. Foraging Ants: The most common way that ants get into our properties is due to their foraging behaviour. The worker ants are the ant equivalent of Ray Mears or Bear Grylls in that they are expert foragers. They seek out sugary foods and insects which they take back to the nest and when a good food source is found they will lay down scent trails that will allow other ants to find the food. This effective system is why infestations can happen overnight. Small spillages and stored food are appealing to ants and they will readily take advantage of the treats they find in our homes and businesses. Therefore, one of the most important preventative measures when deterring foraging ants is to ensure our cleaning, secure food storage and waste management are diligently carried out. Foraging ants will utilise any small gaps in the fabric of our buildings. The usual entry points are gaps around outflow pipes from kitchens, gaps in the pointing of bricks/stonework, airbricks, cable conduits, gaps under door thresholds, gaps under doors, gaps around windows etc. Ants Nesting Indoors: If the ant’s nest is within the building, this can make the infestation more intense and cause more issues within the property. Ants nests can be situated in a variety of locations within the fabric of the building. They can be in the cavity walls, under floors, in stud walls, in the conduits of pipes and cables etc. These indoor nests are usually in a hidden location, which necessitates the knowledge and skills of a professional pest controller to eradicate the nest. The biggest problem with indoor nests is when they produce flying ants during the Summer (See Ant Life Cycle Below). This emergence of sometimes thousands of ants can be distressing to the occupants of the home or business. Live Ant Sightings: The sight of foraging ants is usually the first sign of an infestation. Black ant workers are 2 to 3mm long, so an individual ant is not easily spotted. However, as the activity levels increase, the presence of several ants moving along trails is a good indicator that there is a nest nearby. Following these foraging ants along their trails can sometimes give us an indication of where the nest may be situated. If the nest is under floors, in cavity walls or under paving slabs, sometimes a gentle tapping motion can bring out guard ants that react to a potential threat to the colony. When flying ants are produced by the colony, their emergence will give away the location of the ant’s nest. If the nest is inside the property, there will be definitive points in the structure where the ants will be seen emerging. External nests will also give away their location in a similar way. Ant Nests: If ants are nesting outside and close to your property, there are often signs that give away the location of the ant’s nest. If the nest is under paving slabs, block paving etc, there are often small piles of soil/sand. This is the excess material that the ants have excavated while constructing their nests. Depending on the size of the ant colony, there may be multiple entrance points leading to the nest. It is important that during our initial survey of the property that the ant species, extent and level of infestation is identified. From this we will then be able to devise a control programme that will eradicate the ant infestation. Depending on the intensity and the risk to products, we have several insecticidal products that we can deploy to successfully eradicate the ant infestation. During our survey we will provide advice on hygiene, housekeeping and waste management that will ensure that the control programme achieves effective and lasting results. Insecticides: We have professional insecticides that can be applied in variety of situations. In some situations, where the activity levels are high, we might carry out residual insecticidal treatments that will significantly reduce the ant population and prevent the foraging activity of worker ants. In lower level infestations we could deploy insecticidal baits that incorporate an attractive food base with a potent insecticide. These baits are collected by the foraging ants and taken back to the nest, where they are fed upon by the rest of the colony, thereby resulting in the destruction of the ant colony. Proofing Work: If during our survey we find any gaps and defects that are allowing ants to access the property, we will make recommendations for these ingress points to be sealed/repaired. 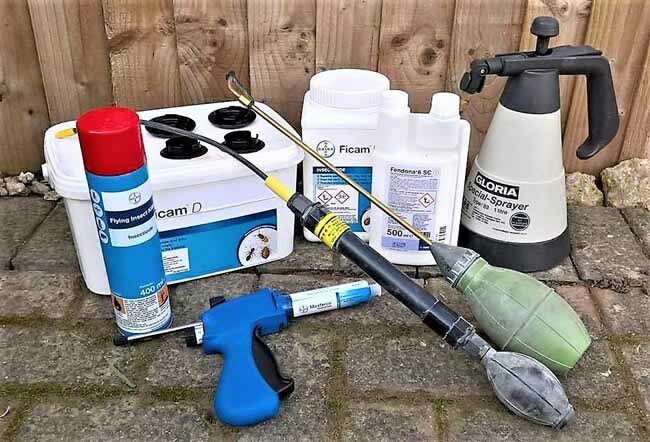 We have an array of specialist professional proofing products that will reduce the risk of ants entering your home and business. There are several species of ant that we at Kestrel Pest Management are asked to control. The most common species that we deal with is the Black Garden Ant (Lasius niger). All ant species live in colonies that are made up of three castes: Workers, Queens and Males. The queens are the only ants that reproduce, the workers are sterile females that carry out all tasks within the nest and the males only job is to mate with the new queens. All ants have a distinctive narrow waist and have a sharp elbow joint in their antennae. Appearance: The worker ant is 2 – 3 mm long, is dark brown/black in colour. The queen is 7 – 10 mm long, is dark brown in colour, the head is always more slender than the waist and the wings (before shedding) are transparent. The males are 3 – 5mm long, brown/black coloured and have a wasp-like appearance, they also have transparent wings. Life Cycle: Black garden ant nests produce flying ants during warm and humid days during the Summer. These flying ants (alates) are the reproductive male ants and virgin queen ants(gynes). Sometimes this swarming is coordinated over large areas, where many nests will produce their flying ants simultaneously. The males and new queens take to the air in order to mate and this is called the nuptial flight. After mating the males will quickly die and the mated queens will land and shed their wings. Once the queens have shed their wings, they will seek out a suitable site into which they can excavate a chamber. Within this chamber she will lay her first eggs and she will tend them through the larval stage until they until the first worker ants emerge from pupation. Throughout this period the queen will not forage for food and will rely on the energy provide by absorbing her wing muscles. Sometimes the queen might produce trophic eggs, which are unfertilised eggs that are used by the queen for food. The emergence of the first worker ants allows the queen to concentrate all her efforts on egg laying. These first workers can be quite small compared to the better provisioned workers that are produced later in the year. 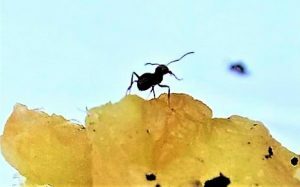 The workers ants, which are sterile females, take over all other tasks within the nest such as tending the eggs and larvae, feeding the queen, keeping the nest clean, defending the nest from predators and foraging for food. 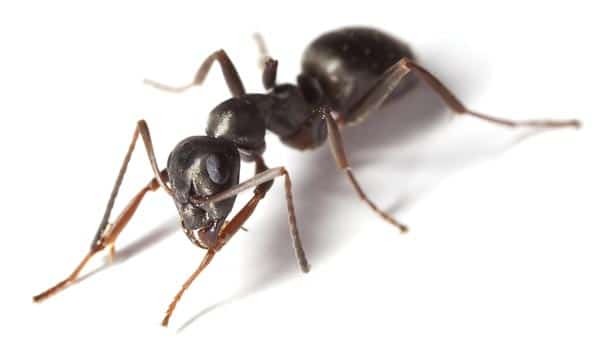 Although they do not posses a sting, black garden ants can deliver a painful bite along with formic acid, that can be quite painful on sensitive skin. The ant’s eggs are very small (0.5mm), oval and have a sticky surface that enables them to be clumped together and transported by the worker ants. The eggs quickly hatch into larvae, which are transparent and banana shaped. The larvae are covered in fine hairs that allow them to be adhered to each other. They are legless and rely on the workers to feed them and in return the larvae emit a sugary liquid that is readily consumed by the workers. The larvae spend about 3 weeks at this stage and undergo 3 moults before pupation and change in size from 1mm to 4mm. After 2 weeks the newly formed workers emerge from their metamorphosis and will initially stay in the nest undertaking various duties. As the workers age, they will then undertake the riskier tasks of foraging and defending the colony. For the ant’s nest to grow, there must be a regular supply of food. This is achieved by worker ants radiating out from the nest searching for food. When they find a food source, they will lay down a pheromone trail while returning to the nest. This trail can then be followed by other workers so they can also exploit the food source. Ants will also farm aphids to obtain food. As aphids feed on plant material, they exude access liquid in the form of honeydew, which is a sugary secretion that ants find very palatable. This mutualistic behaviour provides the ant with a calorie rich food source and provides the aphids with protection from predators. After several years the nest may contain up to 15,000 individual ants. It is within these established colonies that the queen then produces the reproductive flying ants and the life cycle begins again. We also provide control against several other species of ants that are mainly tropical in origin. The dynamic nature of these tropical ant’s colonies mean that a specialist approach is required for their successful eradication. Kestrel Pest Management have the specialist knowledge and products to successfully eradicate these tropical ants. Pharaoh’s Ant (Monomorium pharaonis): This is a tropical ant species only found in heated buildings in the UK, such as apartment blocks, hotels hospitals etc. It is only 2mm long and has a pale straw colour thorax with a darker head and abdomen. Established colonies can contain over 100,000 individuals and can have many queens in the colony. They spread their infestations by ‘budding’, which is where groups of ants leave the main nest to set up satellite colonies. Ghost Ant (Tapinoma melanocephalum): This is another tropical ant species that is only found in heated buildings in the UK. It is only 1.5mm long with a pale abdomen and legs, with a darker head and thorax. It is a less common ant than the Pharaoh’s ant. Ghost ant colonies can also contain multiple queens. Argentine Ant (Linepithema humile): Yet another tropical ant species that is only found in heated buildings in the UK. It is bigger than the Pharaoh’s ant and the ghost ant at 2.5mm in length and is brown coloured. Argentine ant colonies also can contain multiple queens. Roger’s Ant (Hypoponera punctatissima): Another tropical species that is mainly found in heated buildings in the UK. Unlike the other species, they are predatory in nature and forage for live prey such as the larva of small insects, which they kill by injecting venom by means of a sting. They are 2-3mm long, dark yellow in colour and has no eyes. They require areas of high humidity and are often found in drains. Unlike the other species, they do have the ability to sting people. Ants evolved over 140 million years ago and there are an estimated 22,000 different species. Ants are extremely strong, and some species can carry objects 100 times their own body weight. That is like an average sized man carrying 8 tonnes. Ants have 2 stomachs, one is for its own personal food and one of which is a social stomach and is used to share food with other members of the colony. This sharing of food within the colony is called trophallaxis. Various defence and predatory mechanisms exist among the various ant species. Some bite using large mandibles, some species sting and some species spray formic acid. The heads of large biting ant species have been used as sutures to close wounds. The ants are encouraged to bite across the wound before the body is torn away. Ant colonies are the original farmers; some species farm aphids for their sweet honeydew and some species farm fungi within their nests. The bullet ant is said to have the most painful insect sting. It gets its name from the intense pain felt when people are bitten. Have a problem with ants?